Uh oh – here we go again. 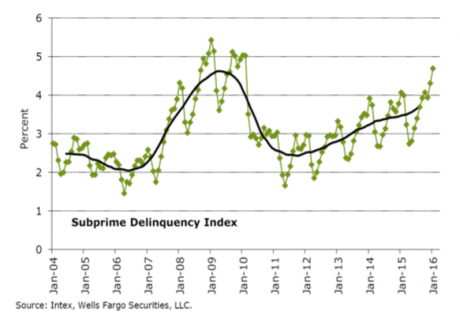 Do you remember the subprime mortgage meltdown during the last financial crisis? Well, now a similar thing is happening with auto loans. The auto industry has been doing better than many other areas of the economy in recent years, but this “mini-boom” was fueled in large part by customers with subprime credit. According to Equifax, an astounding 23.5 percent of all new auto loans were made to subprime borrowers in 2015. At this point, there is a total of somewhere around $200 billion in subprime auto loans floating around out there, and many of these loans have been “repackaged” and sold to investors. I know – all of this sounds a little too close for comfort to what happened with subprime mortgages the last time around. We never seem to learn from our mistakes, and a lot of investors are going to end up paying the price. People, especially those with shaky credit, are having a tougher time than usual making their car payments. According to Bloomberg, almost 5% of subprime car loans that were bundled into securities and sold to investors are delinquent, and the default rate is even higher than that. (Depending on who’s counting, delinquency is up to three or four months behind in payments; default is what happens after that). At just over 12% in January, the default rate jumped one entire percentage point in just a month. Both delinquency and default rates are now the highest they’ve been since 2010, when the ripple effects of the recession still weighed heavily on many Americans’ finances. It is quite foolish to try to sell expensive cars to people with bad credit. This is especially true now that the economy is slowing down significantly in many areas. But people are greedy and they are going to do what they are going to do. The business of “repackaging” these loans, including subprime and deep-subprime loans, into asset backed securities has also been booming. These ABS are structured with different tranches, so that the highest tranches – the last ones to absorb any losses – can be stamped with high credit ratings and offloaded to bond mutual funds designed for retail investors. Deep-subprime borrowers are high-risk. Typically they have credit scores below 550. To make it worth everyone’s while, they get stuffed into loans often with interest rates above 20%. To make payments even remotely possible at these rates, terms are often stretched to 84 months. Borrowers are typically upside down in their vehicle: the negative equity of their trade-in, along with title, taxes, and license fees, and a hefty dealer profit are rolled into the loan. When the lender repossesses the vehicle, losses add up in a hurry. It almost makes you want to tear your hair out. This is exactly the kind of thing that caused so much chaos with subprime mortgages.